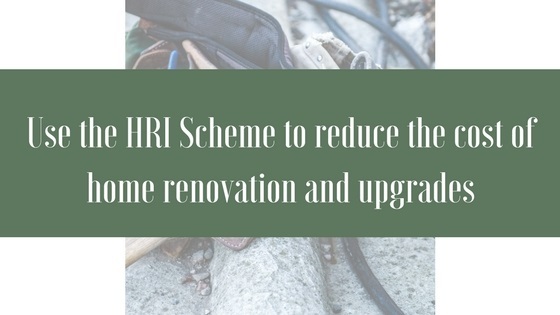 The Home Renovation Incentive (HRI) is a relief from Income Tax (IT) for homeowners, landlords and local authority tenants. Following the successful implementation of the scheme over the past few years an extension until December 2018 was announced during Budget 2017. You can claim the HRI Tax Credit for repairs, renovations and improvements to your home or rental property. The credit is 13.5% of your qualifying spend up to a maximum of €30,000 per property – so it is well worth looking at. The tax credit will be given over the two years following the year in which the work is carried out. The work must be carried out before 31st Dec 2018. Homeowners must be Local Property Tax (LPT) compliant in order to qualify under the Scheme and building contractors must also be tax compliant in order to carry out works. The Scheme is administered through Revenue’s online systems. What Type of work Qualifies? services such as architects’ fees. a property that you rent out. This must be occupied by a tenant and registered with the Private Residential Tenancies Board within six months of the work being completed. Properties such as holiday homes or new builds do not qualify for the HRI scheme. The only exception to this closing date is if planning permission is required for the work. If this is in place by 31 December 2018, you can claim for work carried out and paid for up to 31 March 2019. To qualify for the Home Renovation Incentive (HRI) Tax Credit, you must spend at least €4,405 (excluding VAT) on each qualifying property. You can claim the HRI Tax Credit up to a maximum of €30,000 (Excl. VAT) of your total cost. Any amount over €30,000 will not be taken into account. The total cost can be from one job or from a number of jobs on the property. It can also be done by one or more qualifying contractors. Any work that you claim for must be done and paid for before 31st December 2018. If you have received a grant for some of the work, the cost of that work can still be included but the qualifying expenditure will be reduced by three times the amount of the grant payment. If you have a single rental property that is converted into multiple rental units, each unit is treated separately for HRI. The maximum of €30,000, (excl. VAT) applies to each of the individual rental units. To qualify for the Home Renovation Incentive (HRI) Tax Credit, the contractor carrying out the work must be registered for VAT and be tax compliant. You can check that your contractor qualifies by making sure they enter the details of the work through HRI online. If the contractor does not qualify for HRI, they will not be able to enter the details through HRI online. It is up to you to confirm that the contractor has input details of the work on HRI online before the work begins. The contractor must also enter details of payments as you make them on HRI online You will be unable to claim the HRI Tax Credit if the contractor does not do this. How is the Tax Credit paid? You claim the HRI Tax Credit the year after the work has been carried out and paid for. Revenue Online Service (ROS) if you pay tax through self-assessment. Alternatively, your accountant can make the claim on your behalf. Before you start thinking about what you are going to do with your tax credit, be aware of the restrictions in place for this scheme. I think I qualify – how do I apply? Is your existing agent giving you information on potential schemes you can avail of? If not, are you missing out on other very relevant information? At MLMG our purpose is to keep our clients up to date and informed. Contact us here or call MLMG on 07493 21420 for a consultation.